The word poetry dates back to the 14th century and functions as a noun. Verse, metrical writing, poems, the production of a poet, the writer is bound. Writing that formulates, a concentrated imaginative awareness. Which is actually a short story that dances, in all fairness. Of experience in language chosen and arranged with meaning and rhythm. To create a specific emotional response of sound and then some. Something likened to poetry, especially in beauty of expression. Through any topic of poetic quality or aspect, not just affection. 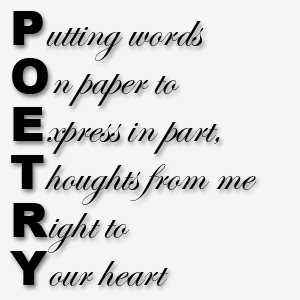 Poetry, the placement of words that can fill one with emotions. With emotional changes much like the waves of an ocean. Can take one from spiritual highs, to feeling all warm inside. Some with meanings that vary, as the reader decides. Poetry, a short story, set with a rhythmic flow. With content and meaning as the writer does show. And it really don’t matter, what the topic may be. All have a short story as one soon will see. The big difference being, it flows with the words. And can fill one with emotions that we have in this world. Poetry, a faucet of thoughts, written to express what the writer is saying. Whether the topic be serious, meaningful, romantic or just playing. Every single human being, will experience poetry in some form. From hearing a new born baby cry, or watching the sun rise in the morn. Our life itself is poetic, mystical, unknowing, painful and tenderness you see. And what helps us all get through this life, is a word called poetry.